All transactions are safe and secure with a reliable history in online purchasing behind each of our associates. Buy the Happy Festivus t-shirt to own Seinfeld clothing and merchandise. As the holidays quickly near, there's no better time to spread a little festive cheer. 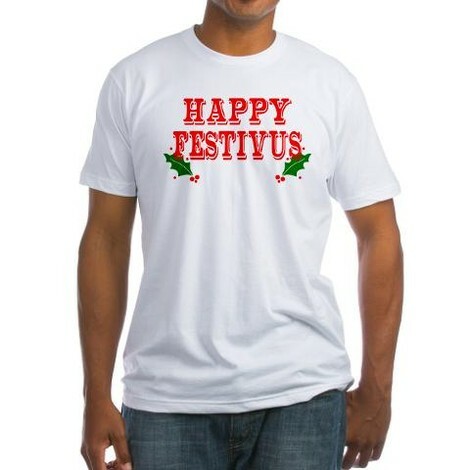 Don't get wrapped up in tinsel, lights and ribbon from hell, just grab a Happy Festivus t-shirt to wish everyone well. If they look at you confused and ask, "What's it about?" Tell them it's a day of airing, sharing and letting your grievances out. Inform them that Festivus is like Christmas without the commercialized cheer, there's no Santa, no tree and no ridiculous reindeer. In addition to the Happy Festivus tee above, browse the Seinfeld Clothing Gallery for more apparel like men's and women's clothes, kids shirts or hoodies.